Shimmering LOVE Shines Through coaster sets are favours with a warm feel and contemporary appeal. new twist on a modern classic - it's a mirror-like shine! 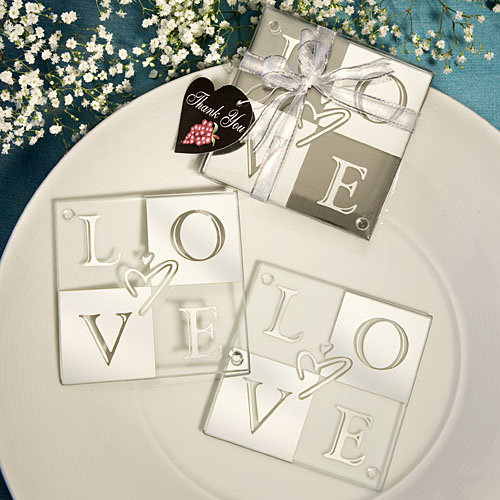 Each set contains two 3.5" square glass coasters with the famous alternating block LOVE design in reflective silver and clear, finished with a freeform double heart design at its center. Sure to fill your guests' homes with LOVE, LOVE Shines Through coaster set favour is beautifully packaged in a clear box tied with a white organza ribbon and an attached heart shaped Vineyard Collection grape design "Thank You" tag.